Thank you for reading my race report! I’m not the best writer but it was great to hear your comments. What an awesome race! I need to qualify and get back there again asap. This is the interesting part. Trying to recover with a baby in tow. So Nick had a bad night last night. He didn’t want to be put down and ended up in our bed. He woke up after 4 hours which is what he would do as a newborn, but he’s now into 5-6 hours and I was hoping really hard for 8 hours last night. I really needed the sleep. After getting him to go to bed finally around midnight and him waking up at 4am, I think he slept till around 8am. I could have still slept for another 12 hours, I swear. We got up and later in the morning I went swimming. I don’t trust the daycare at the Y, they didn’t check to see if my sticker matched his when I picked him up. For all they knew, I could have been ANYone. So we’ll have to see about that. Swimming felt really good. It loosened up my legs, which are pretty sore, mainly my quads. Bill gave me a massage yesterday which super helped. I tried the recovery socks too and I’ll do a review on what I think of them soon. 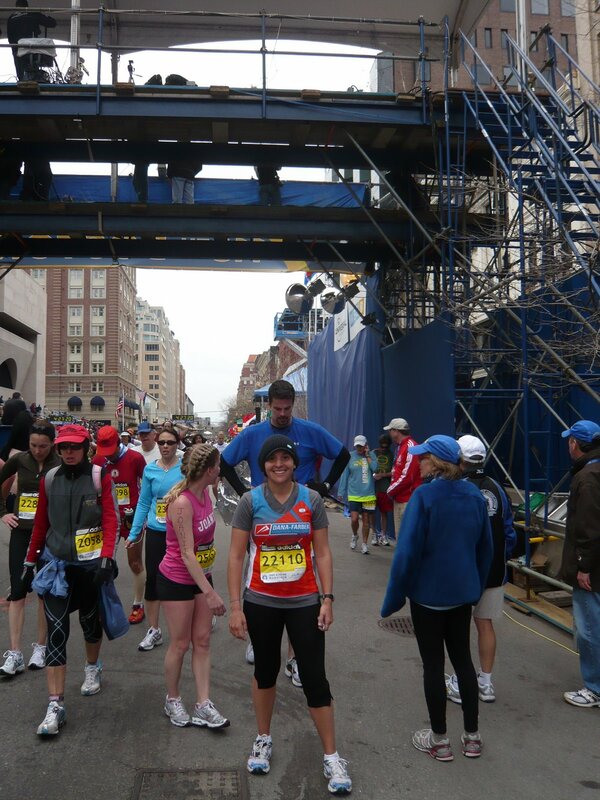 I already want to do another marathon – like this weekend! Not in the cards, but that was AWESOME!! I have Broad Street run (10 miler) coming up in a week and a half, and maybe a 5k or 10k in May, but that is it until the fall. This fall my plans are the Philly Distance Run and Philly Marathon. I feel like I’m going to have marathon mania for way too long. Don’t you hate that right after a marathon you want to do another right away? Maybe I’ll find a May or June one in temperate weather! Or just hold off till fall! I figured I’d have the Boston Blues after this one. It has been my focus for the last 9 months! A big note of thanks for Bill’s support throughout all of the training for Boston. 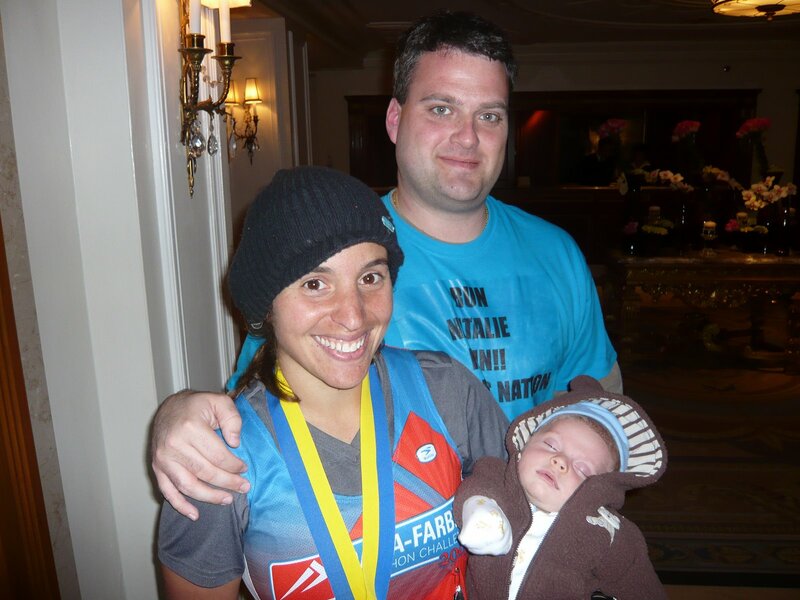 He endured weekend mornings of me running on the treadmill while pregnant and never doubted that I was listening to my body or questioned me running. He also took care of Nick on all of the weekends that I went for long runs in preparation for Monday. Without his support, I couldn’t have had this experience and reached this goal. Love you Beez! **Also thanks to my sister for pushing through those 5.2 miles with me. She was my photographer, encouragement, and company. She is not a big fan of running and did the same thing for me in the NYC marathon in 2006. I was in BAD shape in that one and she held my hand and ran in jeans to get me to finish! She also had to put up with sleeping in my parents room for the weekend and both sets of parents all weekend long. love you sis! When do you usually start running? I feel like I usually take one day off, or swim that next day and then run 2-3 easy miles 2 days later. I haven’t ran today, and might wait until tomorrow to do that, but what do you do? What is your week after the marathon like? Logisitically. I brought about a sack load of pumped milk that had been frozen on the trip with us. I hardly used any of it and ended up having to throw it away. For traveling I had all this milk in ice and when we arrived in Boston, we got a fridge with a little freezer. This worked out great. We only needed the bottles for marathon day so we used a few things of saved milk to make the bottles and what I pumped in the morning. Nick ate 2 bottles that day but then slept so much that he didn’t need to eat until I was all done. I’m wondering if the lactic acid bothered him last night, he has never been that fussy before bed or cried whenever we put him down. Music I wore my ipod but it was unnecessary. If you do Boston, the crowds are your ipod. 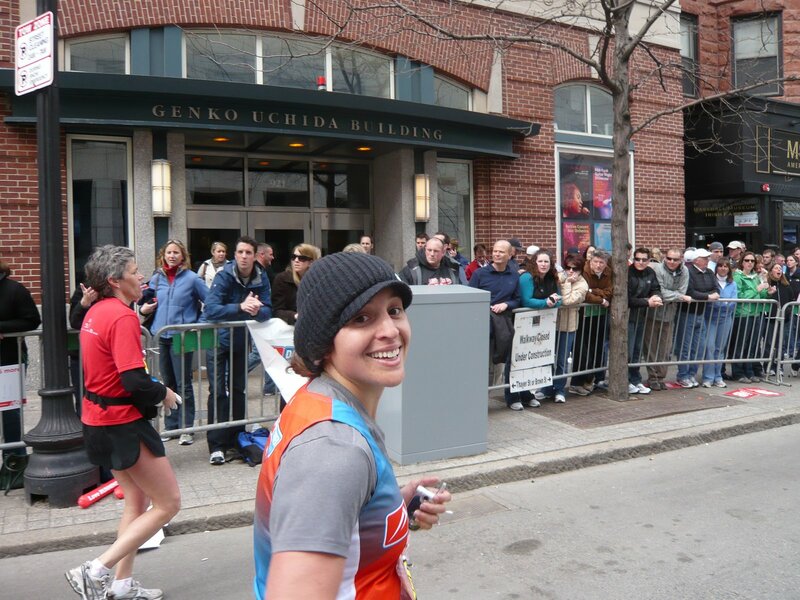 I turned it off around mile 22, but up until then it was mostly on low- background music in my hat. And if you do use your ipod, don’t do the shuffle for a marathon. This sucky song (well, okay I was lazy and didn’t fix my playlist before the race) kept coming on and I didn’t hear some of my good songs. Official guy was taking pictures so I was trying to show my bib. It just looks funny. Running so slow, it looks like I’m walking. This bagel could have been poop and it still would have tasted like gold. I don’t think you would have liked it if it had been poop. can’t agree more about how important husband support is! i’m still working on that…part of my workout challenges. 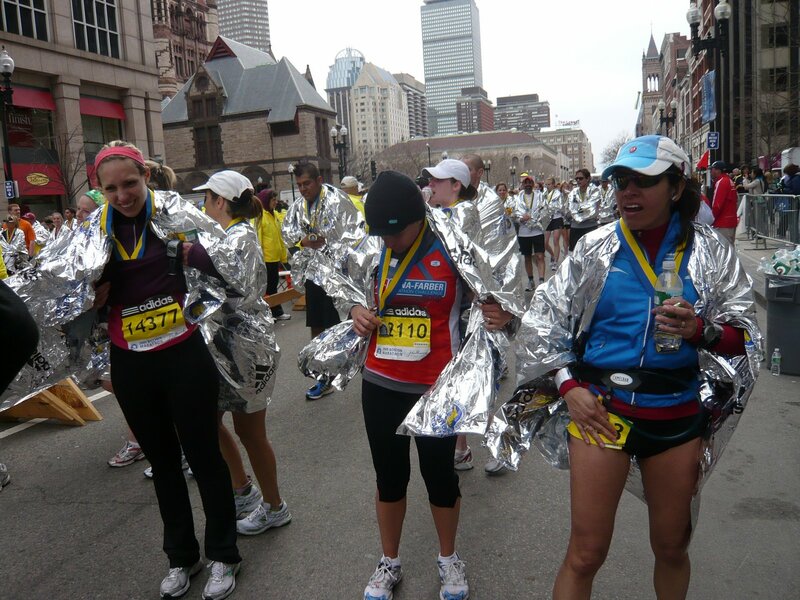 Glad you don’t have the post marathon blues! Be careful about running too much in the next 2 weeks. Give yourself adequate time to recover so you don’t feel like crap every time you go out for a run now. 😉 Easy stuff now, and you’ll feel great sooner! holy tall guy in the 2nd to last pic. hes like a giant!i love your race report. your seriously awesome. and your considering ANOTHER one so soon… you ROCK!I love ALL of the pics and i love that you thanked bill… your soo sweet! I am always ready to run another marathon the day after I finish one. You get such a high after. Grat job again. Like others said, don’t start running too soon. Those Boston hills do a number on your legs. And isn’t it funny in how the last miles of a marathon you are hating life and then as soon as you cross the finish line you want to do another one? 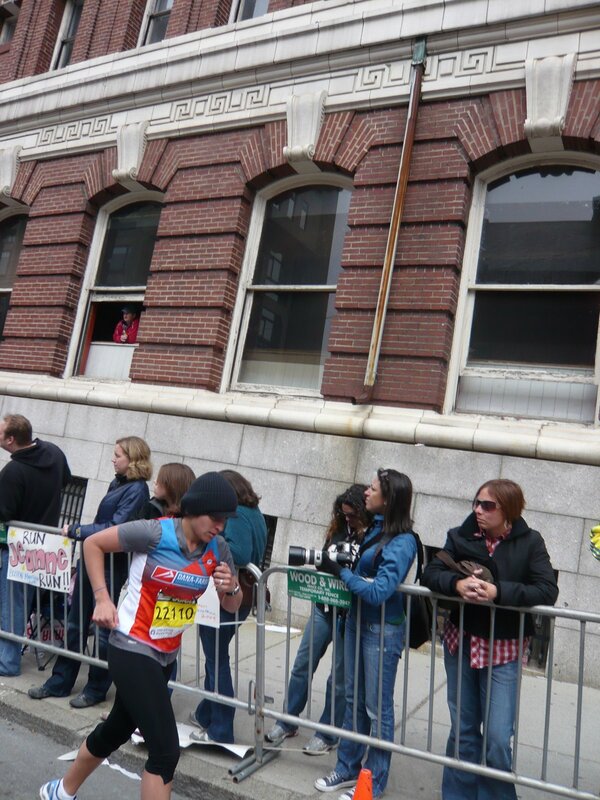 And Boston especially has that effect, the crowds there are like no other. I say run a little when your body feels ready…obviously nothing long. but if you want to do a short mile or two to shake out the legs it should be ok. hey i’m a running nut though.your family support is awesome and amazing! i will need to save these posts for otheres shoudl I ever be in this situation! 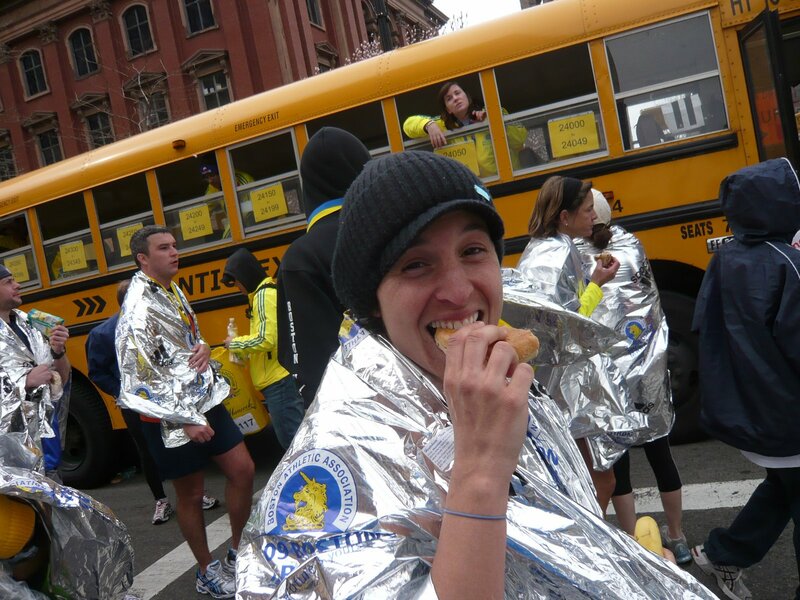 I totally know what you mean about running another marathon immediately after. 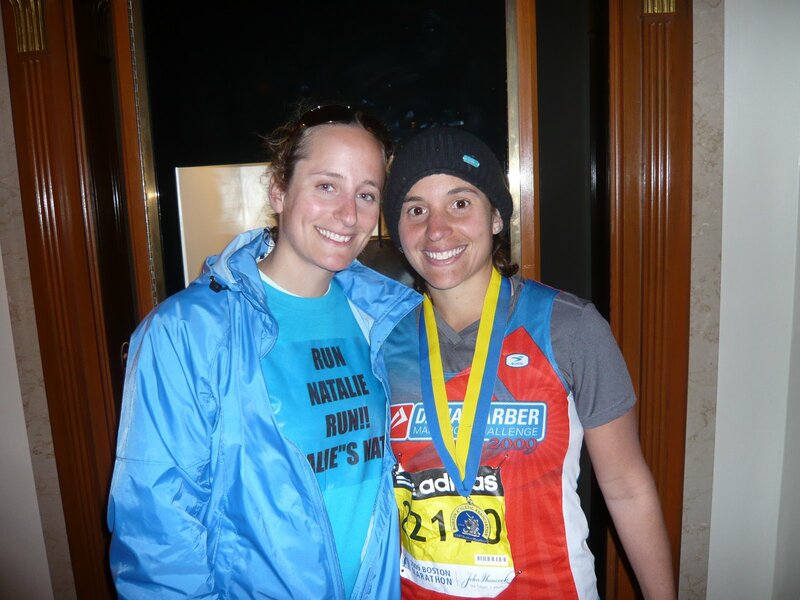 As you know, I just ran Big Sur on Sunday but I wish I was running Eugene marathon this weekend!!! Best of luck to your next one! !